Celebrate your independence from drinking the same light beers you buy every summer. The idea of Fourth of July food and beer pairings might make even the most avowed beer geek chuckle—and frankly, they’re kind of right. As America’s hottest major holiday of the year (literally), the primary characteristic many people will be looking for in a beer is something cold. Meanwhile, unlike, say, Thanksgiving, the food served at Independence Day parties tends to be decidedly down-home: hot dogs, burgers, potato salad, potato chips. But before you stock your cooler with ice cold Natural Light, keep in mind that beer pairings don’t have to be pretentious. The advent of craft beer means that America is now home to more beer styles than ever before, many of which are perfect for summer weather and straightforward food. As a result, the list below isn’t meant as the be-all and end-all for matching eats and drinks. Let’s be honest: At a summer barbecue, your plate is a hastily constructed pile of foods and flavors anyway. Instead, browse the below with the idea that, at the very least, you can serve something more interesting than a Budweiser in an America can. It’s not officially the Fourth until you grabbed yourself a dog. 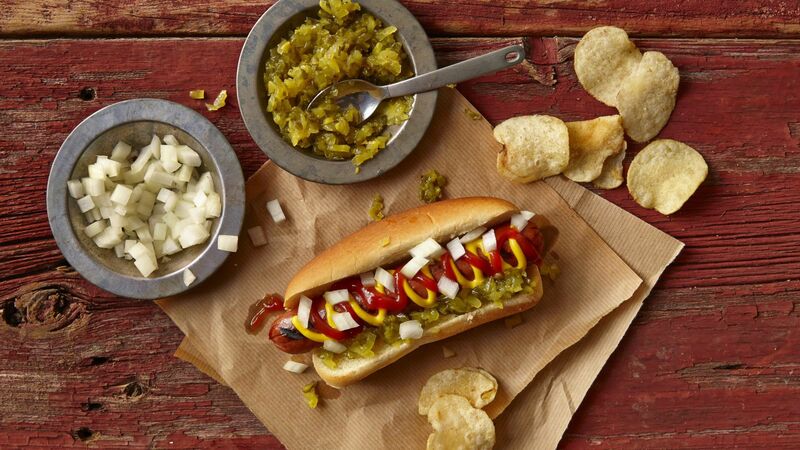 Hot dogs are tricky because they don't exactly have a ton of flavor. You'll probably want to consider your topping, but assuming you’re going the simple route (mustard and, outside of Chicago, ketchup) you’ll want a relatively simple beer that won’t overpower the mild sausage and is crisp enough to cut all that fat. A zwickel, like you can find from Missouri’s Urban Chestnut Brewing, is a soft, clean beer that should hit the spot. However, those looking to mix things up may want to consider a smoked beer, also sometimes known by its German name, rauchbier. Germany’s Schlenkerla specializes in smoky brews, and their Helles Lagerbier will add a real smoked punch to your whole meal. 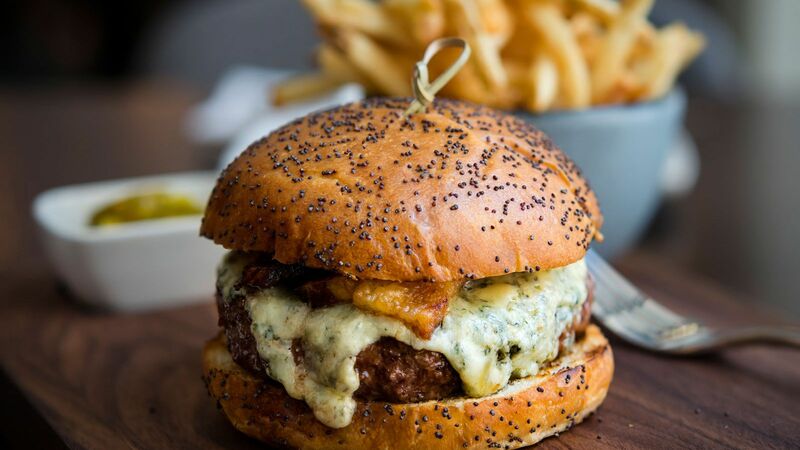 Burgers and beer are a classic combo, in part because a hearty burger can pair with pretty much any brew. Like hot dogs, toppings can change the game, but in general, burgers are a great opportunity to drink something with a bit more intensity. Go with a grapefruity India pale ale like a classic Two Hearted Ale from Michigan’s Bell’s Brewery or a Fresh Squeezed from Oregon’s Deschutes Brewery. 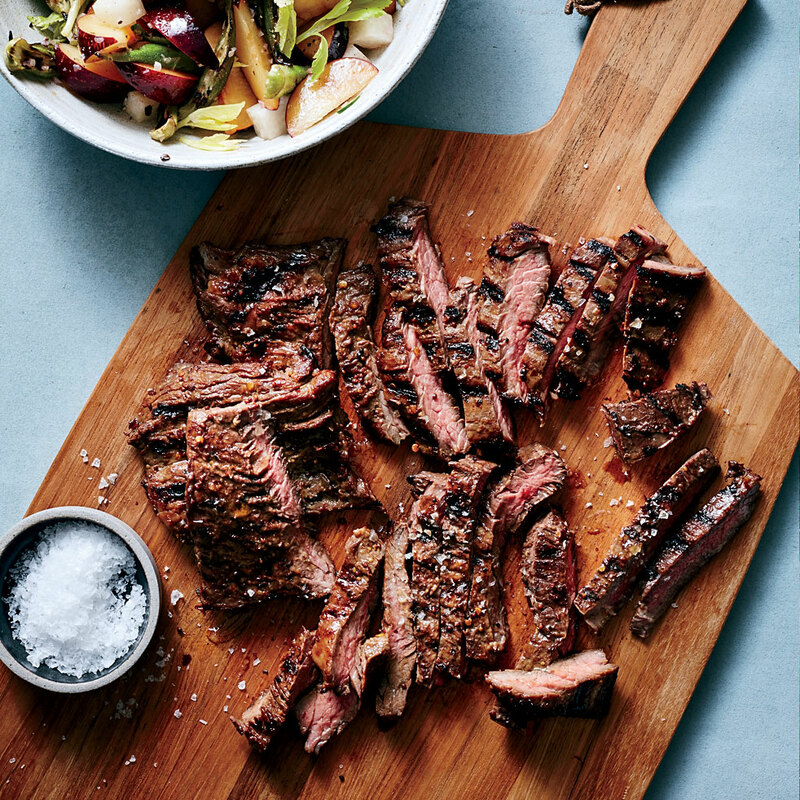 Nothing says summer like grilled steak, and the combination of meat with crunchy okra and sweet plums is an unexpected touch. If you’re living large this Fourth and going the steak route, warm weather beer pairings get a bit trickier. In the winter months, you might opt for a porter or stout, but in the summer, those can weigh you down. So let’s approach this from a different angle: Your classic steak wine pairing is a big, bold red like a Cabernet Sauvignon. 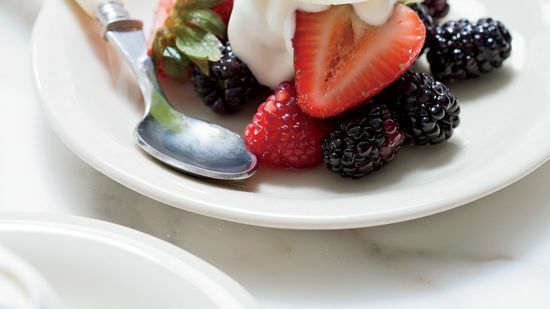 To get similar berry notes, try a fruit-accentuated beer. The sour Belgian style kriek, which is made with cherries, is a great balance of fruit intensity with an acidic edge to match the heat. Look for something like Brouwerij 3 Fonteinen’s Oude Kriek. Want something even bigger? Try Brouwerij Rodenbach’s Alexander, a Flanders red ale that’s also produced with cherries. 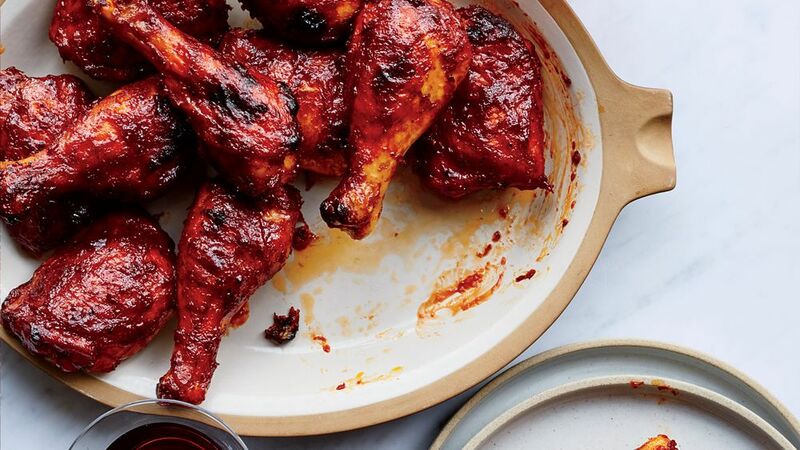 Barbecue sauces can cover a wide range of flavors, from sweet to acetic. When choosing a beer, you can take a similar approach. If you want to really lean into the dark, sweet flavors of molasses found in Kansas City-style barbecue sauce, you can choose a huge malty doppelback like The Devastator Double Bock from Utah’s Wasatch. Of course, if you want to cut the flavors of an overly sweet sauce, or double down on the vinegar flavors of Carolina-style sauce, choose a lightly-soured Berliner weisse like Hottenroth from California’s Bruery Terreux — or even go for the best of both worlds with something like Festina Peche from Delaware’s Dogfish Head, a Berliner made with peaches providing a mix of sweet and sour in every sip. Thanks to its delicate flavors, most seafood is extremely easy for pairings: If it’s the kind of seafood you’d hit with a squeeze of lemon, go with a beer with strong citrus notes – just make sure the base of the beer is light enough that you won’t overpower everything else. A Belgian-style table beer can work extremely well here: Maine’s Allagash released a take on the style, Hoppy Table Beer, that’s easy to find. A lighter saison can have similar flavors too, such as Apex Predator from Colorado’s Off Color Brewing. 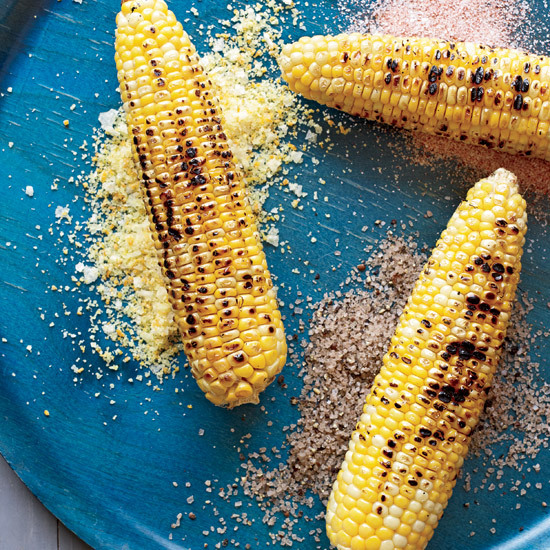 No July 4 celebration is complete without corn on the cob. This version is flavored with a trio of seasoned salts. Of course, the Fourth of July is mostly about just hanging around outside enjoying the weather and the company of friends. If you’re looking for an all-around good style that will pair with everything, go with a light, modern American pale ale. Something like Peeper from Maine Beer Company or Boat Beer from New Jersey’s Carton Brewing are both lower strength (4.2 percent and 5.5 percent ABV respectively) and will keep you satisfied no matter what you’re eating or how long you plan on partying.